While the west coast of North America was known to the Chinese, in particular those working as sailors before the Gold Rush, our story begins in 1850. Starting with the Gold Rush, most Chinese immigrants entered California through the port of San Francisco. The Chinese formed part of the diverse gathering of peoples from throughout the world who contributed to the economic and population explosion that characterized the early history of the state of California. These immigrants proved to be productive and resourceful contributors to a multitude of industries and businesses. The initial group of Chinese argonauts sought their livelihood in the gold mines, calling California Gam Saan or Gold Mountain. Others contributed their agricultural and fishing skills. In addition and by far the most impressive feat of the Chinese was the work the contributed on the western section of the transcontinental railroad. 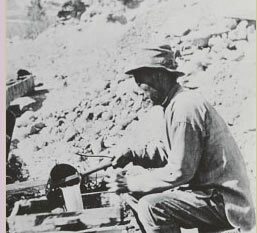 Chinese American workers laid much of the tracks for the Central Pacific Railroad through the foothills and over the high Sierra Nevada, much of which involved hazardous work with explosives to tunnel through the hills. Their speed, dexterity, and outright perseverance is a testimony to their outstanding achievements and contributions to opening up the West. Copyright © 2005 The Regents of the University of California. All rights reserved.